The PSNI Chief Constable has warned the “haphazard approach” to dealing with the past is sapping confidence in the police. In a strident letter to the Westminster Northern Ireland Affairs Committee Mr. Hamilton also confirmed that the alleged Bloody Sunday shooters, the suspects in the 197 4 fatal shooting of JP Cunningham in Benburb and loyalists and republicans implicated in suspected terrorist offences by the Boston College tapes, were the only people to have been reported to the Public Prosecution Service by his force’s Legacy Investigations Branch. He pointed out that between January 1969 and March 2004, there were more than 3,200 homicides across the North, many of which remain unsolved. Mr. Hamilton said he felt the need to write to the committee after appearing before it at Christmas in order to clarify certain matters and also in order to dispel claims that a “new, bespoke ‘probe’ into deaths” attributed to the British Army was underway. He wrote: “In all of these cases, in one form or another, it has been anticipated that PSNI must investigate. The Minister said the haphazard approach to the past was not working. 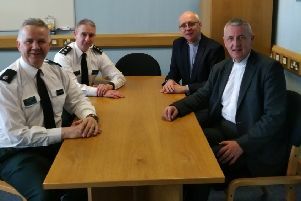 “Since becoming Chief Constable, I have warned time and again that the current haphazard approach to dealing with the past in Northern Ireland saps confidence in policing and the criminal justice system more broadly.